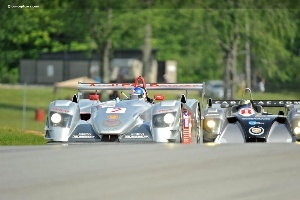 The 2010 Vintage Grand Prix of Mid-Ohio consisted of three Enduros, a Trans-Am feature, and all 10 SVRA (Sportscar Vintage Racing Association) classes. Datsun/Nissan was the featured marque and the famed Datsun/Nissan driver John Morton was the Grand Marshal. In addition to the vintage racing along the 15-turn, 2.4-mile track, there were numerous Car Club Corrals and the 12th Annual British Car Showdown and a Concours d'Elegance. Datsun and Nissan has earned over 80 SCCA racing titles during its career in the sport, a win at LeMans and four consecutive wins at Daytona, as well as off-road victories in the Safari Rally. These iconic cars have been piloted by legendary drivers such as Bob Sharp, Paul Newman, Walt Mass, Frank Leary and John Morton. In honor of this company's accomplishments, the GP at Mid-Ohio featured a special Datsun/Nissan exclusive race with over a dozen cars from the company's past, ranging from the tiny Fairlady 'roadsters' and Bluebird sedans, to the revolutionary 240Z and its successors. John Morton has had an extensive career as a racer. He won the SCCA C Production championship in a 240Z in the early part of the 1970s, later racing in Formula 5000, Can-Am, IMSA, and CART. In his more recent professional races, he raced Porsches in the Grand Am Rolex Sports Car Series and the American Le Mans series in the late 1990s and early 2000s. Currently, most of his racing is now done in vintage competition. With over ten groups of cars circling the track, there was plenty of race action all weekend long. Most of the groups were well seeded, with over a dozen cars in nearly all groups. Though this is a vintage event, several modern cars were present, including the Audi R8 and a Cadillac LeMans prototype car. Though extremely fast, these modern cars were not able to keep pace with David Nikolas's March 817 Can-Am racer. The CanAm car was powered by a 407 cubic-inch Chevrolet small block engine fitted with a Lucas Fuel injection system. In period competition, the car claimed two first place finishes, four pole positions and two fastest race laps. Another fast group was the Group 9 open-wheel cars (Wings and slicks formula cars complying with SVRA post-1973 formula car regulations), led by Shelby Merson in a Lola T97/20 Indy Lights car. The loudest group was the Group 6 big-bore production sports cars and sedans produced through 1972. 19 cars lined up on the starting grid for the 8 lap race, many of cars being Camaros, Corvettes, Mustangs, and even a pair of GT40s. Peter Klutt in a 1969 Corvette was first to cross the finish line, followed closely by John Farano in a 1974 Corvette. Group 1 was nearly an all-British car race, occupied by several MGs, Austin-Healeys, Triumphs, and Lotus's. The fastest car in the group was a Lotus Seven driven by Simon Wilson-Taylor. Group 3 also had several Lotus 7s and MGs. Other popular cars in this group were Datsuns and Porsches. Both on the track and in the in-field, there were plenty of vintage cars to behold. On the track, the cars were driven pretty aggressively, with close races, and even some off-the-course action.